replication of virus in cell. Interferon regulates immune function via enhancing activity of macrophages, cytotoxicity of lymphocytes against targets cells, and activity of NK cells. Anterferon® was intramuscularly administered to rats 5 times a week at does of 1.5*107 IU/kg, 1.5*106 IU/kg and 1.5*105 IU/kg for 6 months, respectively. There was no abnormal reaction on rat's general cases, body weight and behavior. Experiment was repeat on rabbits for 3 months, there was also no pathological change on rabbits' internal organs due to toxicity of Anterferon®. 3~6*106 IU intramuscular or subcutaneous daily injection for 4 weeks, then 3 times a week for more than 16 weeks. occurred, administration regimen should be modified or stopped. If any allergic reactions occurred, administration should be terminated mmediately. Leucocytopenia and thrombocytopenia may occur for a few patients and may disappear after cessation of therapy. Anorexia, nausea, diarrhea, vomiting, alopecia, lower or higher blood pressure, and CNS disorders may rarely occur. Interferon may change activities of some enzymes, especially inhibit cytochrome P450; thus it can affect the metabolism of some medicine such as cimetidine, diphenlhydantoin, warfarin, hyphyline, apavvin. 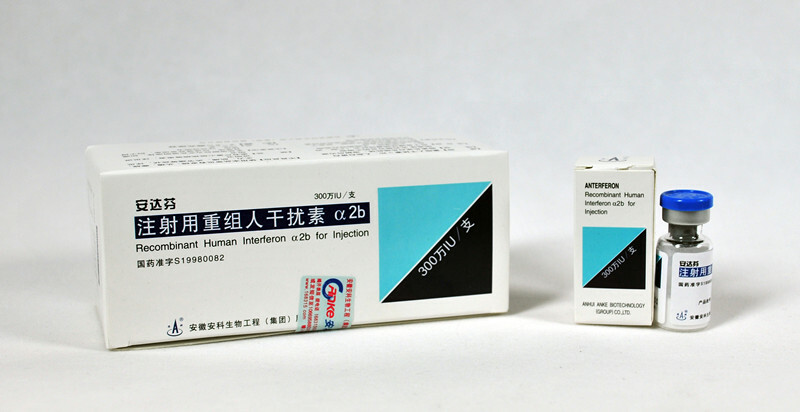 Interferon may also interact with central nerve medicine.